Friday the 13th is supposed to be an unlucky day, the sort of day you trip on your shoe laces or lose your wallet or get bad news. But maybe it's not so bad. Consider this: On April 13th--Friday the 13th--2029, millions of people are going to go outside, look up and marvel at their good luck. A point of light will be gliding across the sky, faster than many satellites, brighter than most stars. What's so lucky about that? It's asteroid 2004 MN4 ... not hitting Earth. For a while astronomers thought it might. On Christmas Eve 2004, Paul Chodas, Steve Chesley and Don Yeomans at NASA's Near Earth Object Program office calculated a 1-in-60 chance that 2004 MN4 would collide with Earth. Impact date: April 13, 2029. The asteroid is about 320 meters wide. "That's big enough to punch through Earth's atmosphere," devastating a region the size of, say, Texas, if it hit land, or causing widespread tsunamis if it hit ocean, says Chodas. So much for holiday cheer. Asteroid 2004 MN4 had been discovered in June 2004, lost, then discovered again six months later. With such sparse tracking data it was difficult to say, precisely, where the asteroid would go. A collision with Earth was theoretically possible. "We weren't too worried," Chodas says, "but the odds were disturbing." This is typical, by the way, of newly-discovered asteroids. Step 1: An asteroid is discovered. Step 2: Uncertain orbits are calculated from spotty tracking data. Step 3: Possible Earth impacts are noted. Step 4: Astronomers watch the asteroid for a while, then realize that it's going to miss our planet. Killer Asteroid! headlines generally appear between steps 3 and 4, but that's another story. Astronomers knew 2004 MN4 would miss Earth when they found pictures of the asteroid taken, unwittingly, in March 2004, three months before its official discovery. The extra data ruled out a collision in 2029. 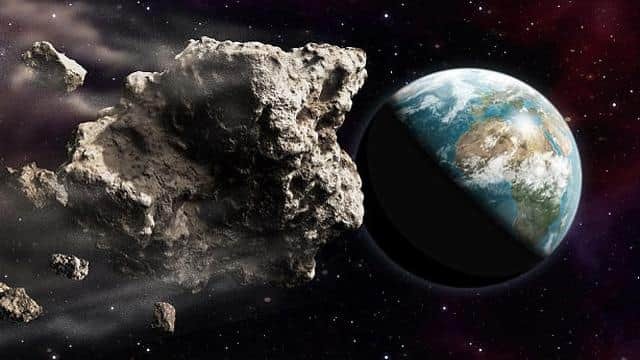 Instead, what we're going to have is an eye-popping close encounter: On April 13, 2029, asteroid 2004 MN4 will fly past Earth only 18,600 miles (30,000 km) above the ground. For comparison, geosynchronous satellites orbit at 22,300 miles (36,000 km). "At closest approach, the asteroid will shine like a 3rd magnitude star, visible to the unaided eye from Africa, Europe and Asia--even through city lights," says Jon Giorgini of JPL. This is rare. "Close approaches by objects as large as 2004 MN4 are currently thought to occur at 1000-year intervals, on average." "Our ability to 'see' where 2004 MN4 will go (by extrapolating its orbit) is so blurred out by the 2029 Earth encounter, it can't even be said for certain what side of the sun 2004 MN4 will be on in 2035. Talk of Earth encounters in 2035 is premature." In January 2004, a team of astronomers led by Lance Benner of JPL pinged 2004 MN4 using the giant Arecibo radar in Puerto Rico. (Coincidentally, the Arecibo dish is about the same size as the asteroid.) Echoes revealed the asteroid's precise distance and velocity, "allowing us to calculate the details of the 2029 flyby," says Giorgini, who was a member of the team along with Benner, Mike Nolan (NAIC) and Steve Ostro (JPL). More data are needed to forecast 2004 MN4's motion beyond 2029. "The next good opportunities are in 2013 and 2021," Giorgini says. The asteroid will be about 9 million miles (14 million km) from Earth, invisible to the naked eye, but close enough for radar studies. "If we get radar ranging in 2013, we should be able to predict the location of 2004 MN4 out to at least 2070." The closest encounter of all, Friday the 13th, 2029, will be a spectacular opportunity to explore this asteroid via radar. During this encounter, says Giorgini, "radar could detect the distortion of 2004 MN4's shape and spin as it passes through Earth's gravity field. How the asteroid changes (or not) would provide information about its internal structure and material composition." Beautifully-detailed surface maps are possible, too. The view through an optical telescope won't be so impressive. The asteroid's maximum angular diameter is only 2 to 4 arcseconds, which means it will be a starlike point of light in all but the very largest telescopes. But to the naked eye--wow! 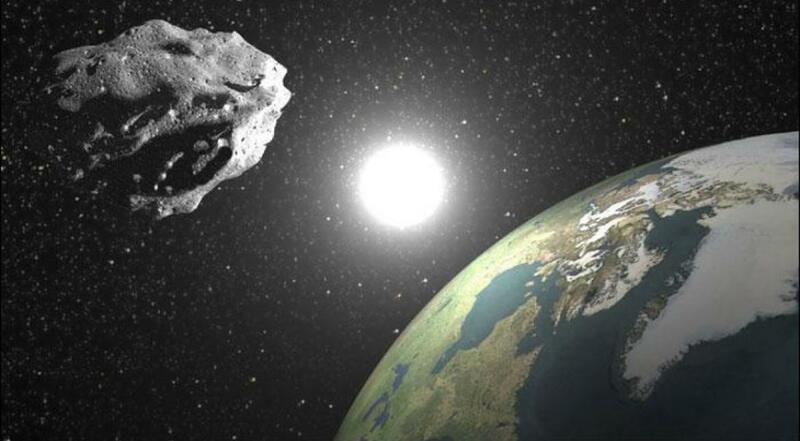 No one in recorded history has ever seen an asteroid in space so bright. Friday the 13th might not be so bad after all.